When Pia casually suggested last year that she would want to invite her friends at CKC back to her home in Denmark to paddle and see some of the beautiful coast of the Island of Fyn (Funen in Danish), I don’t think any of us imagined just what an outstanding trip this would be. This short blog can’t possibly do justice to the wonderful 4 days we had. But I tried to summarise the trip and give you the highlights. Seven of us flew over to Copenhagen early on the Friday morning and were met at Kastrup airport by Pia and her paddling buddy Jakob. Pia took us for a quick whirlwind tour of the Copenhagen centre, where we had a traditional Danish lunch by the canal, before driving the two hours to take us westwards over to the Island of Fyn and to Odense, where Pia and Jakob are members of the Odense Kayak Club. We had a special treat in store for our evening meal. A fantastic little “restaurant” run on a type of cooperative basis for members, where everyone takes turn at cooking meals. For a very small fee to cover food costs we were treated to a fabulous meal and wonderful Danish hospitality. We then picked up our boats from Odense Kayak Club. We were all stunned by the fabulous club facilities, which included a gym, kitchen and dining area as well as sauna! (Think we should make a note of that in any ambitious future plans for CKC.). The club was very generous in letting us borrow some of their high quality kayaks and kit and some private members lent us their own fibreglass boats, which was extremely kind and trusting. Another drive, some shopping en route, and we arrived in the little summerhouse we were renting near Faabourg, on the southern coast of Fyn. A long first day, but it was fantastic. We awoke on Saturday morning to dry, but windy conditions and Pia suggested we head down the coast to launch further east. The paddle out to the islands of SkarØ was a bit of slog into a tough headwind but on the plus side the windy conditions made for a more interesting paddle. We spent the rest of the day paddling between a few other islands, stopping for lunch on HjortØ where we met another group of Danish sea kayakers (sea kayaking is understandably very popular here) and then heading west to DrejØ, Although we crossed one of the deep ferry channels on the way, much of this area of water is incredibly shallow. 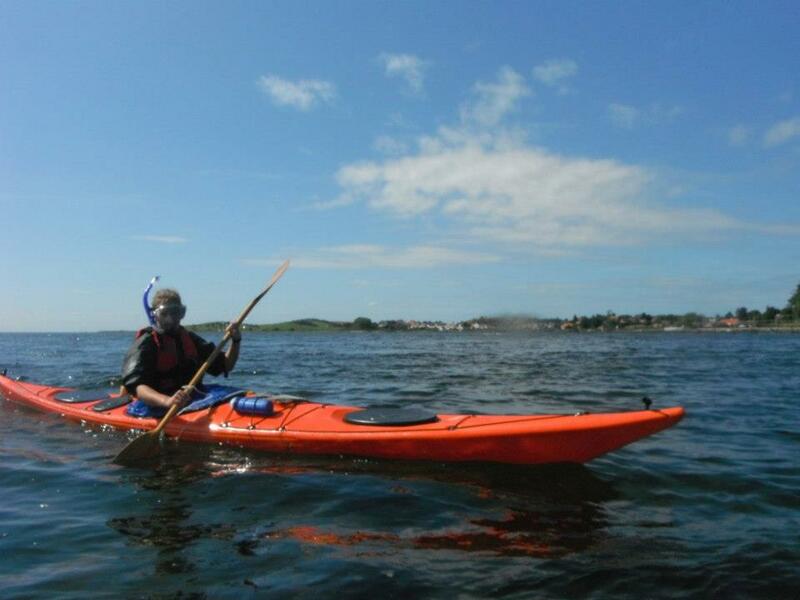 This gave Fiona the wonderful excuse to do some kayak snorkelling, a sport, which she seems to have personally invented. 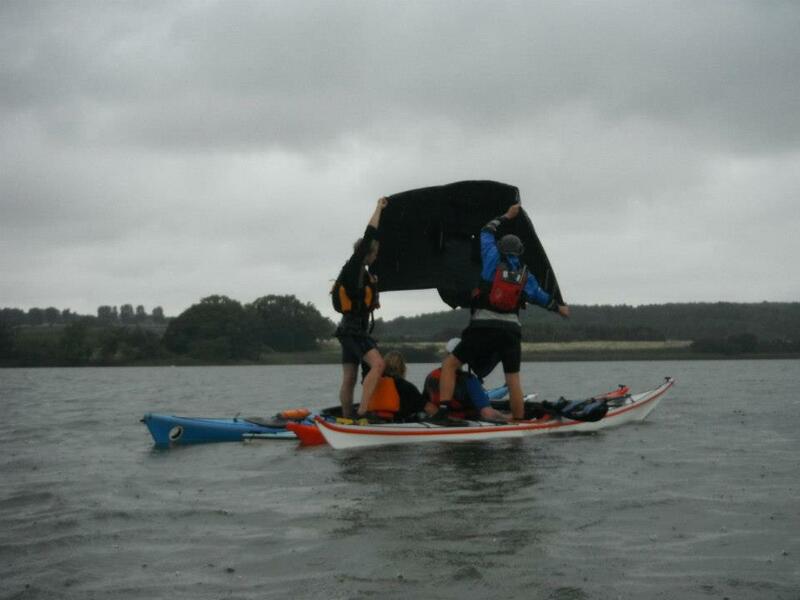 It involves snorkelling upside down in your kayak whilst eskimo rescue style/leaning on someone else’s boat. Mesmerised by the marine life beneath, Fiona seemed oblivious to anything else. DrejØ was one of the larger islands and had a small town and shop, where some of our group purchased much needed coffees, teas and some rather delicious chocolate cakes and biscuits. There islands are so beautiful and peaceful, yet in typical Danish fashion they all seem to have at least a picnic bench and some rather high quality toilet cabins. We headed home, exhausted after a wonderful days’ paddle and Tim cooked an impressive meal to help us re-charge the batteries for the next day. Looking out the window the next morning it was obvious that it was once again very windy and consequently lots of chop on the sea. Pia and Jakob suggested we drive further down the coast to an area more protected from the wind. A day of fun and games was in store and there was generally a lot of messing about in boats. The highlight was the CKC Viking Boat racing championships. The photo best describes the event, which involved 3 or 4 people rafting up, creative use of paddles and cagoules to sail, whilst the paddler in the middle bravely holds the boats together and those on the outside stand in their kayaks, holding the “sails”. This was followed by some more rescues, fun in a playground on the island where Jakob was crowned Champion of Swingball, and Paul threw caution to the wind and launched himself head first down the waterslide. Hilarious. The next day the sun shone brightly and we had a fairly gentle paddle from the beautiful town of Faabourg round the east side of Horneland and past the town of Dyreborg. Some more messing around in boats with practice rescues, another Viking race and more kayak snorkelling took us to the end of our stay in the south of Funen. We were all sad to be heading back up north. 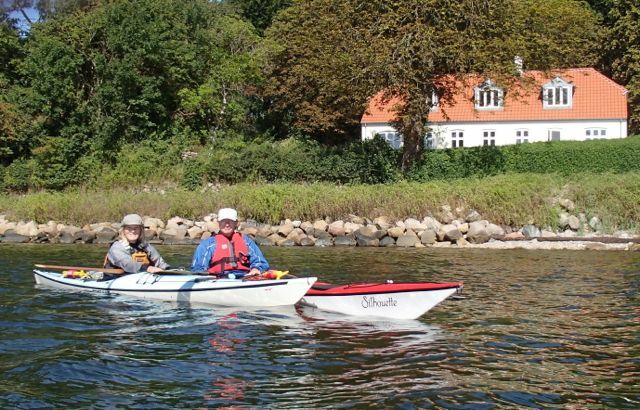 We reluctantly had to return our sea kayaks to Odense Kayak Club for their Monday evening paddling training. We pitched camp in the grounds by the canal and hung our wet gear out to dry. But this was not to be the end of our fun filled kayaking weekend. The next morning, having been woken by Andy on the club megaphone giving the impression of a SBS commander, we quickly got everything packed up and prepared for a morning of experimentation with Odense Kayak Club touring and racing boats. (Yes they really are generous with their wonderful kit). Pia and Jakob were sniggering as they looked forward to seeing how the visitors got on in these more wobbly boats. In short, it was more fantastic fun. We tried lots of different boats, increasing in wobbleyness as the morning passed. (I’m sure Racing aficionados use the “Wobbley scale”?) The amount of falling in also increased but I think it’s fair to say the CKC team did itself proud and we all mastered at least some of the racing craft. After a hasty lunch, (thanks to Paul for some cracking sandwiches), we had to rush to get back to the airport for our return flights. Well, this was the most fantastic trip. We all came back wanting to return to Denmark. Thank you to Pia and Jakob for their wonderful hospitality and to Odense Kayak Klub for their welcome and letting us their kit and facilities. We felt very privileged to be given such insights into your beautiful country and the chance to paddle there. Hope they might invite us back again …maybe…….